Ciara has fired back at the ex-fiance Future’s criticism of her parenting. 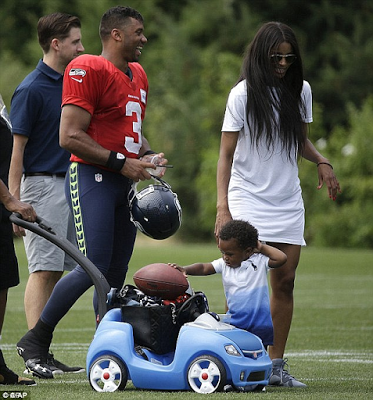 The 29-year-old responded after the rapper blasted her for allowing their son Future Jnr to spend time with her current boyfriend, footballer Russell Wilson. She accused the 31-year-old of double standards, since she looked after his three other children when they were together. ‘It’s been very interesting to hear what a lot of guys have had to say,’ she said in an interview with CBS. ‘I was involved very early in the stage of us getting to know each other,’ she said. However, Future didn’t like the fact his ex was playing happy families with the Seattle Seahawks quarterback, after he was seen pushing the boy’s stroller. ‘If I was a kid, and my momma had some dude pushing me, I would’ve jumped out the stroller and slapped the sh*t out of him,’ the Karate Chop hitmaker said in an interview with New York’s Power 105.1 last month. But Ciara – who made a conscious effort to reach out to Future’s several baby mamas – wanted to know how there was any difference in her situation, and questioned why a parent would have a problem with their child being loved. ‘That’s been a big conversation. It’s kind of like, “Well, what’s the difference here?” she said. ‘I think that even for the men that were outspoken, it’s like, wouldn’t you want someone to love on your child? She said she even tried to have the two men meet to talk, but her ex ignored her. ‘I did reach out to my son’s father for him and Russell to speak and he didn’t want to talk to me,’ she revealed. She also opened up about the fact that her and Russell have decided to remain celibate, in order to ‘challenge themselves’ and get to know each other first. Ciara is Future’s 4th baby mama; he also fathered children with Brittni Mealy, India J and Jessica Smith.